The story of the profession of Civil Celebrants in the western world is daily unfolding. As written elsewhere, Attorney-General Lionel Murphy appointed the first Civil Celebrant (Lois D’Arcy) in July 1973. Dally Messenger III was declared a celebrant in February 1974. Shortly after gazetting him as a celebrant, Murphy appointed Dally as the first secretary of the Association of Civil Marriage Celebrants of Australia (ACMCA). The ACMCA was the original national professional organisation established by Murphy himself. Dally shared Murphy’s ideal to provide ceremonies of substance and dignity for secular people. Dally’s personal story is intimately linked with the history of the civil ceremony as it has developed since that time. 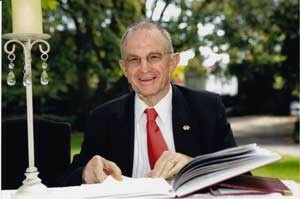 In 1977 he was elected Foundation President of the original Association of Civil Funeral Celebrants of Australia. This pioneering move, though supported by the then Mr Justice Lionel Murphy, provoked a massive controversy. The majority of Civil Celebrants, supported by the Attorney-General’s Department, condemned secular funerals with vehemence. Paradoxically Dally and his supporters received support from the churches. Clergy were uncomfortable officiating at the funerals of the declared non-believers. They especially needed civil celebrants to preside at the funerals of suicides. (In 1994 this organisation became the Australian Federation of Civil Celebrants of which Dally was also the Foundation President and is now a Life Member). Many unsupervised public servants, presumably “religious”, made many moves to suppress the celebrant program in the 1980s and early 1990s, especially by freezing and enforcing a statute prescribed low fee – in a time of high inflation. This caused many excellent celebrants to lose interest and leave, and forced those who stayed celebrants to lower standards. Dally and his supporters did everything they could to counteract and campaign against this destruction, but only with limited success until 1995. When civil celebrancy was established in New Zealand about 1978, it was Dally’s textbook “Ceremonies for Today” which was recommended by the New Zealand government as the standard text for all celebrants. Dally’s three major “Keynote Addresses” to theCelebrants Association of New Zealand delivered in three cities throughout the islands, were highly acclaimed. A significant number of New Zealanders are graduates of the College and Dally’s close colleague is Mary Hancock from Auckland, who established the first course in celebrancy in the world. At Nantucket in the year 2000, Gaile Sarma (later supported by her husband Raghunathan Sarma) asked Dally to assist her to set up civil celebrants in the USA. Dally was employed by the Sarmas to teach and mentor the original group of celebrants – who all graduated with Diplomas from the International College of Celebrancy in 2002. In fact the first 54 celebrants in the USA were graduates of the College including his wife-to-be, Remi Barclay. Other Australian colleagues who assisted him were Diane Storey and John Moore. WhenGaile and Raghu Sarma along with Charlotte Eulette and Cindy Reed, formed the USA Celebrant Foundation, Dally Messenger launched it with a keynote address at the Montclair Library in New Jersey on June 5, 2002. http://dallym.customer.netspace.net.au/Pgs-Articles/LaunchUSA.htm). During this same period, Dally followed up an invitation by Roberto Pravisani and Carol Pool who had established a small group of celebrants in England. He gave a number of lectures and teaching sessions in the UK before returning to Australia. He is currently Patron of the Association of Independent Celebrants of the UK. With the assistance of a graduate of the College, Neil Dorward and college student Terri Shanks, he has set up a division of the International College of Celebrancy in Great Britain. In other countries such as Japan, Hong Kong and Finland, a few celebrants practise their chosen profession with International College of Celebrancy qualifications created in Australia, of which Dally Messenger is the Founder, Course Creator and Principal. Suffice it to say that there are many outstanding celebrants working in this profession, maintaining high standards of service and integrity, in these places despite a wide variation in the marriage laws and ceremony traditions. Celebrancy in Australia is basically a marvellous success story despite its setbacks, trials and tribulations. That its establishment originally came from government, and its continuance depends on government administration, has been a strength and a curse. Non-celebrants in the Public Service from time to time have attempted to destroy the celebrant program or render it ineffective. Dally has always been in the thick of the fight trying to expose the unfairness and destructive ignorance of these public servants when they have emerged. He has also wholeheartedly supported the inspired public servants who have understood the cultural power of civil ceremonies. Destructiveness within the celebrancy ranks has mainly been caused by appointed-but-ignorant celebrants attempting to reduce the office to a legal task only, opposing all cultural and social content. Dally has always pointed out that the reason celebrants were appointed was to give to secular persons, in their ceremonies, all the cultural beauty and meaning which is communicated by music, poetry, story and symbolism — the ceremonial elements which transmit values and convey recognition in an emotionally sustainable way. But one thing is certain, whether one agrees with his ideals and understanding of the role or not, there can be no doubt of Dally’s desire to ensure that the most important of life’s ceremonies are conducted with substance and dignity. This explains why he has been such a passionate advocate for personal quality and integrity in celebrants and ceremony, disassociating himself from the low standards and inadequate interpretations in government administration, and much of the training scene. As I write this (late 2010) celebrancy in Australia is going through another stage of turmoil. The oversupply of celebrants has made the future look bleak. But when all is said and done, the professional, generous attitude of celebrants such as Dally Messenger and the many he has educated and trained, will see this profession grow into providing dignified and effective ceremonies well into the future. A more detailed history of civil celebrancy can be found elsewhere but, by 2010, Dally had an acknowledged track record of being an involved pioneer of celebrancy. He is also acknowledged as mentor and teacher to thousands of celebrants throughout Australia, New Zealand, the USA and the UK. He is currently Principal of the International College of Celebrancy.